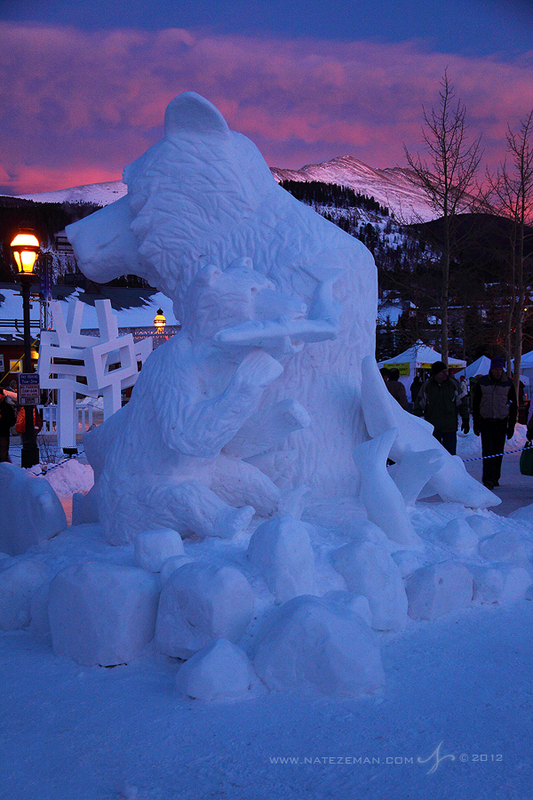 Every year in January, Breckenridge hosts the International Snow Sculpture Championships. It's an event I always look forward to. 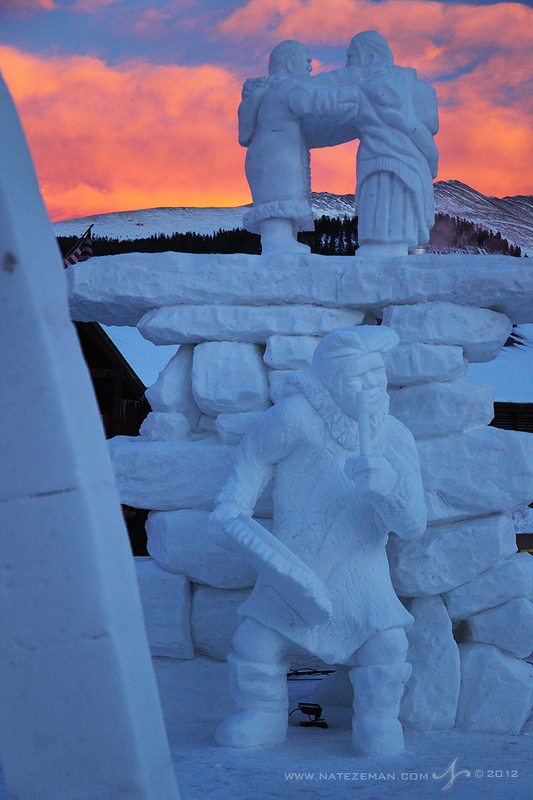 It's amazing to see these teams of sculpters transform 20+ ton blocks of snow into incredible temporary works of art using no power tools or internal supports. This year is the 22nd time the contest has been held. 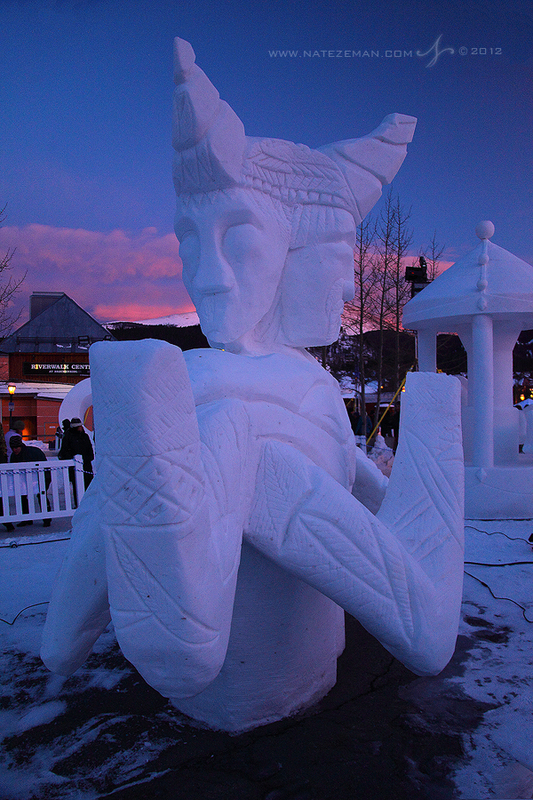 15 teams from 10 countries were on hand to carve. Teams have 5 days to work. Often in incredibly cold conditions typical for this area. 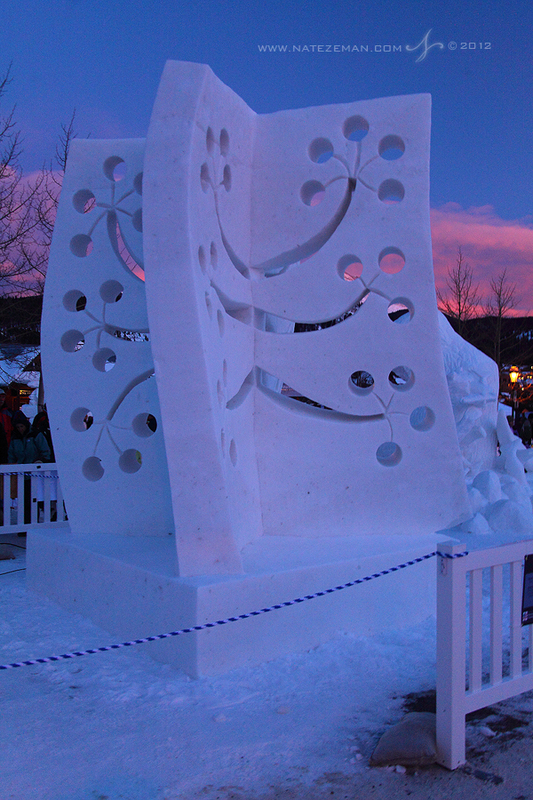 I usually photograph the sculpures each year so I can remember them, as they only last a few days after they are finished. 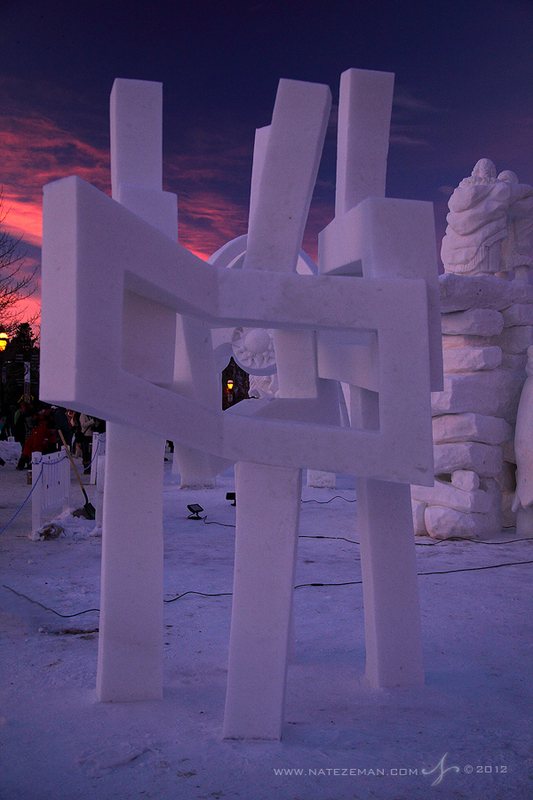 This night, when I walked over to the Riverwalk Center to shoot some photos, I was lucky enough to have an incredible winter sunset to cast warm light on the surreal works of art. A panorama of the Riverwalk Center in Breckenridge. 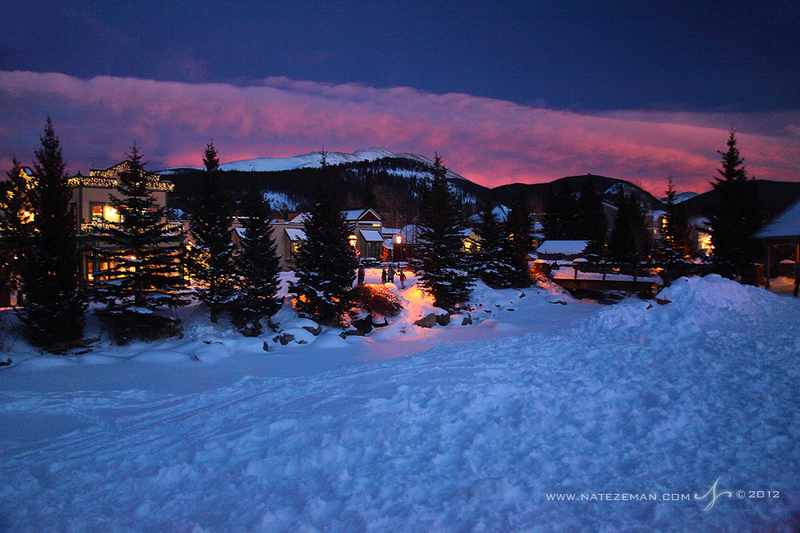 A beautiful Colorado sunset lights up the clouds above baldy mountain. 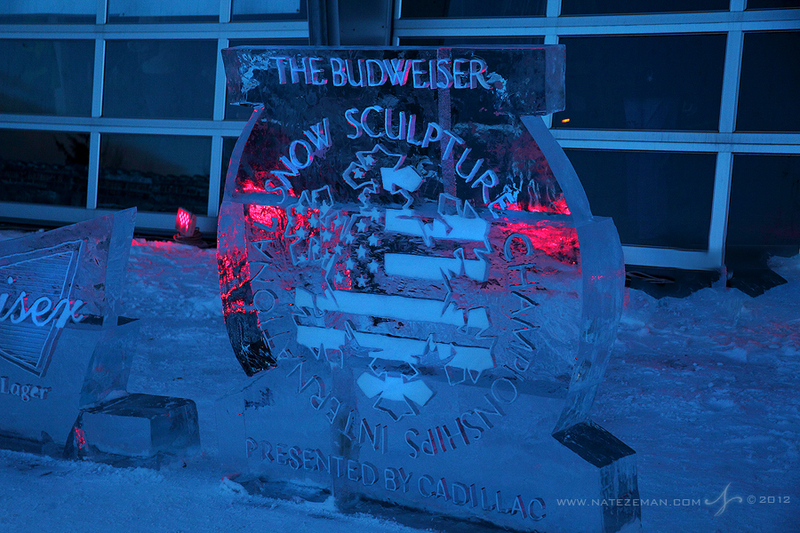 The ice village on the Riverwalk lawn consists of many amazing ice sculptures, most displaying the even sponsors. Very beautiful in its own right. 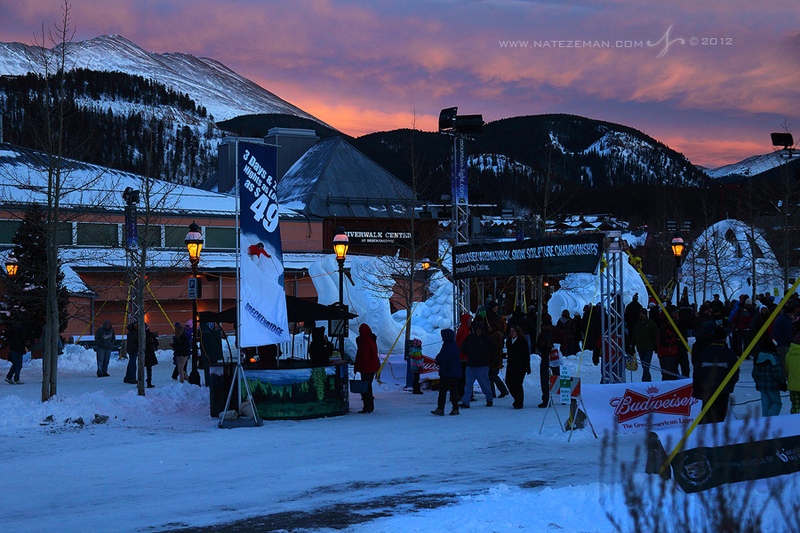 An amazing sunset over the competition area. 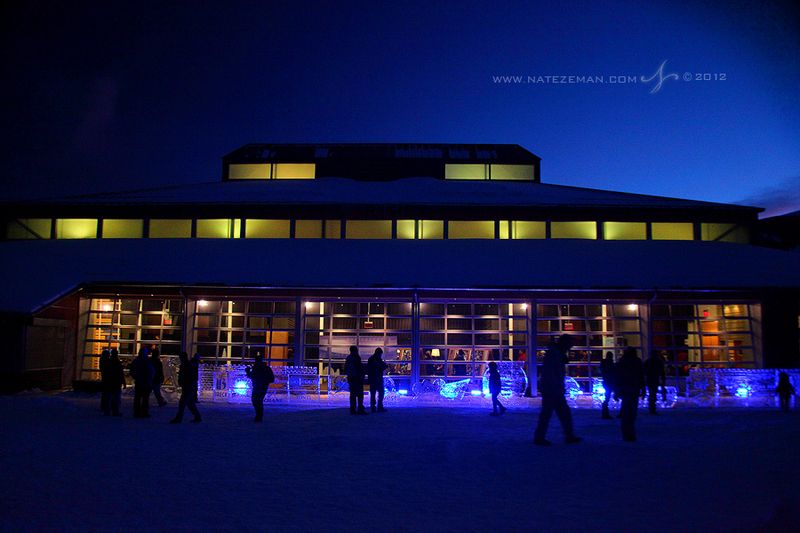 This amazing display of light seemed never-ending. I photographed every sculpture and on my walk home the sky was still glowing pink. 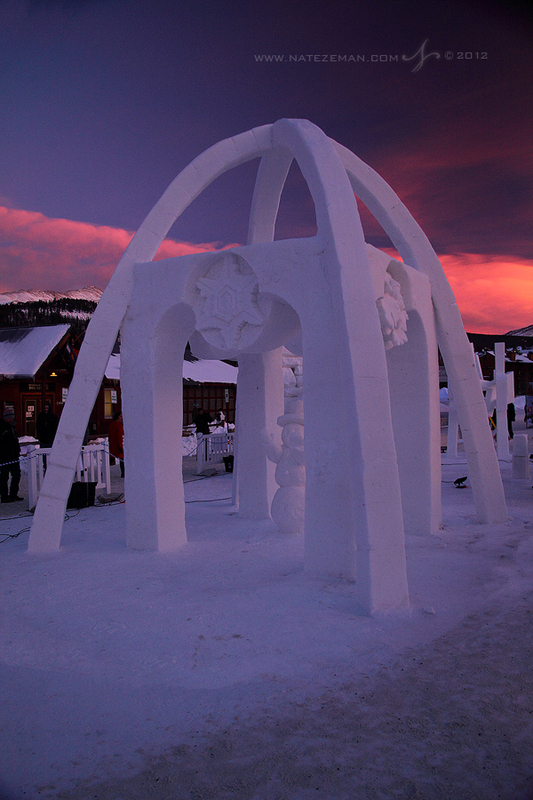 Snow sculptures on display under an amazing Colorado sky. 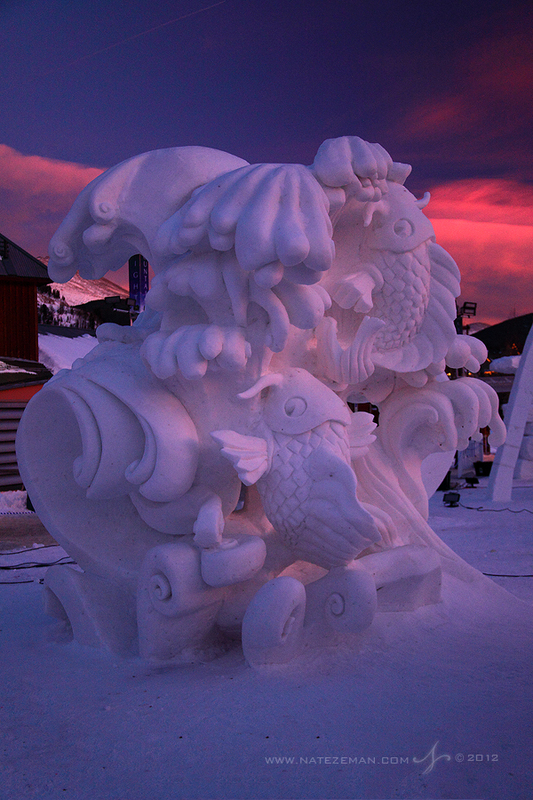 From the offical 2012 Program: "Our concept for Breckenridge in 2012 is "Ai" and is based on Japanese lore. According to Japanese legend, if a koi fish succeeds in climbing the falls at a point called Dragon Gate, it would be transformed into a dragon. The two koi up the falls represent "Ai" or love for all things. Their Climb Together symbolizes aspiration, strength and determination"
From the official event program: "During the first fishing lesson, a young Grizzly Bear shows his aptitude while visiting Greek waters." 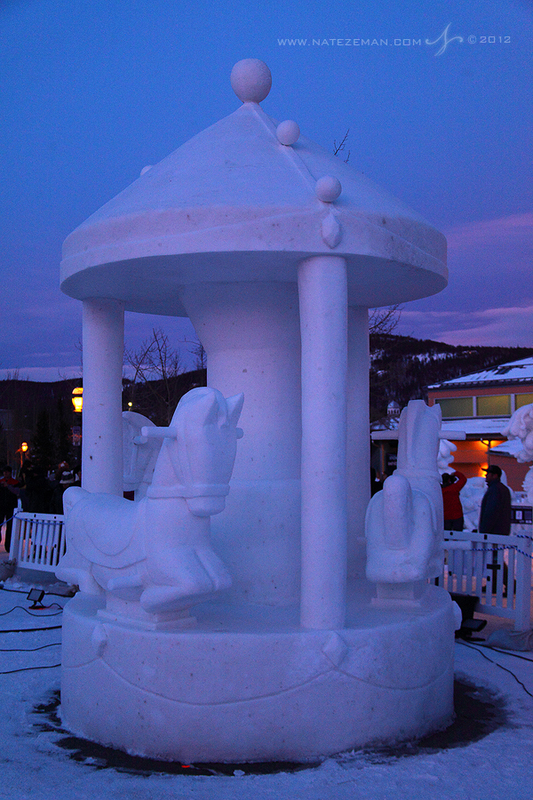 From the official event program: "This snow sculpture symbolizes the various views, positions and perspectives on how facts can be represented and perceived.Emphasis is put on the reality that, depending on point of view or opinion, one can arrive at different conclusions.Ultimately, today’s mostly media driven world with a flurry of projections, needs to be experienced with a critical point of view." 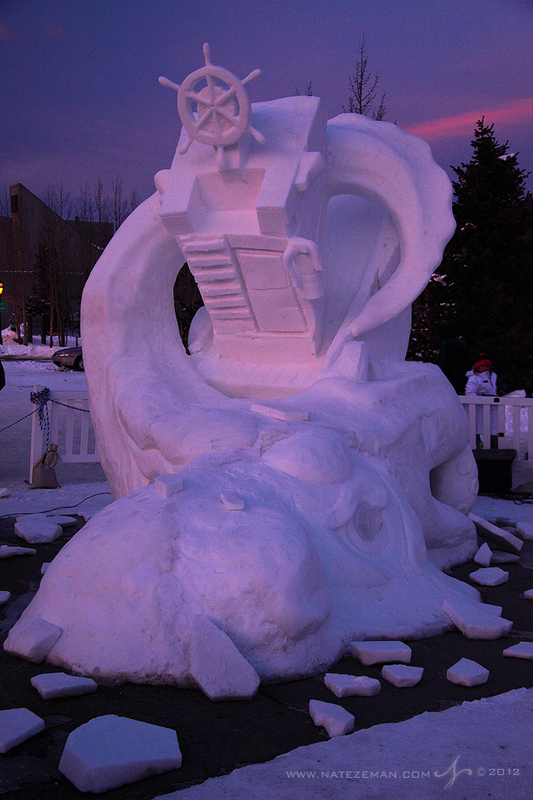 From the official event program: "his sculpture tells a story of courage and curiosity. This epic tail recounts the story of the kings, who went and returned from the edge of the world, showing people that anything is possible, and only our minds limit our actions." 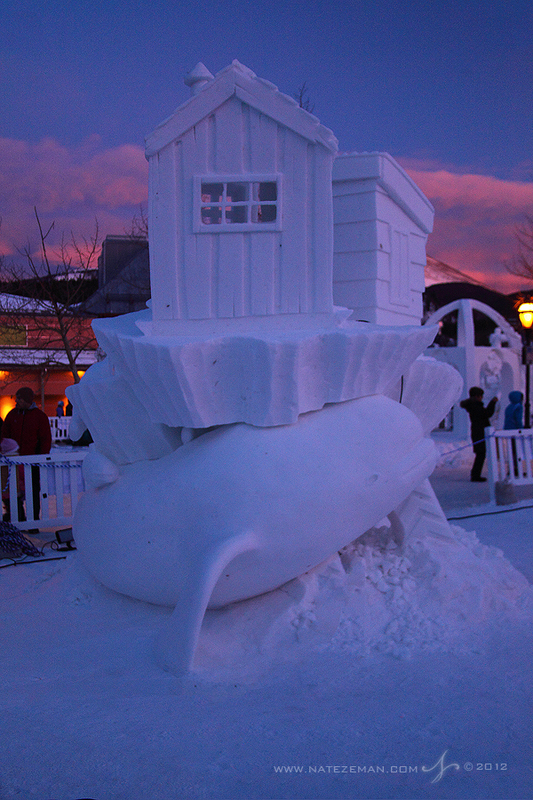 From the official event program: "This sculpture tells a story of courage and curiosity. This epic tail recounts the story of the kings, who went and returned from the edge of the world, showing people that anything is possible, and only our minds limit our actions." From the official event program: "A melting snowman, desperate for just a bit more winter, has journeyed to the ancient Temple of the Seasons to plead for colder temperatures. This lighthearted piece expresses the serious concerns we all share about climate change - and reminds us that we can do something about climate change now, before we find ourselves in the snowman’s sad state." 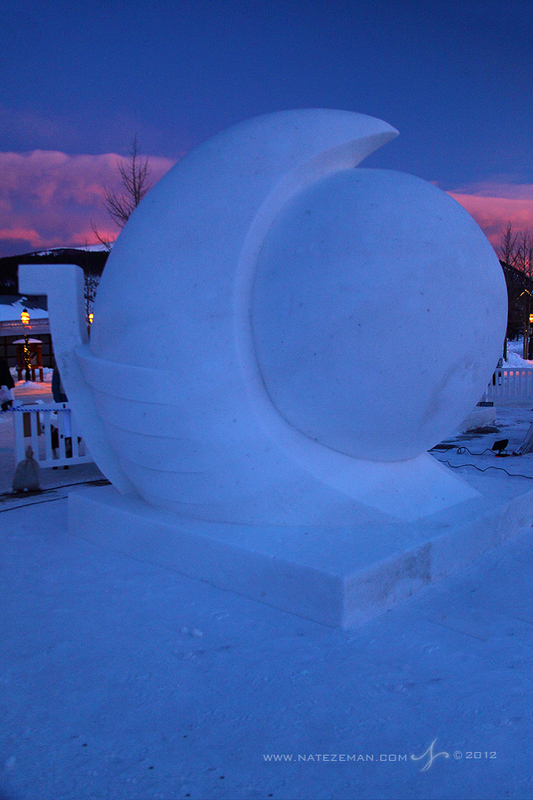 From the official event program: "It is giant and it looks nice. If you touch it in sunlight, it is poisonous. It spreads everywhere if you are not paying attention..."
"The Deadliest Catch: Calamari's Revenge, The Kraken" - Team USA / Alaska * Kids Choice Winner"
From the official program: "Wrapped in the tentacles of a legendarily Kraken, a raider of the deep seeking plunder is transformed from predator to prey. Kraken: A sea monster of colossal proportions. Feeds on whales, ships, and men. Kraken attracted sea life; fishermen returning with an enormous catch were said to have ‘fished over Kraken’. This work juxtaposes man’s insatiable drive to overharvest nature’s bounty with the presupposition that nature will respond with cataclysm. What we really mean to say is, SOS, save our seas!" From the official event program: "Diversity is fundamental part of human nature. Despite many thoughts, many actions, and manifestations of human conditions, one thing remains: The human spirit. 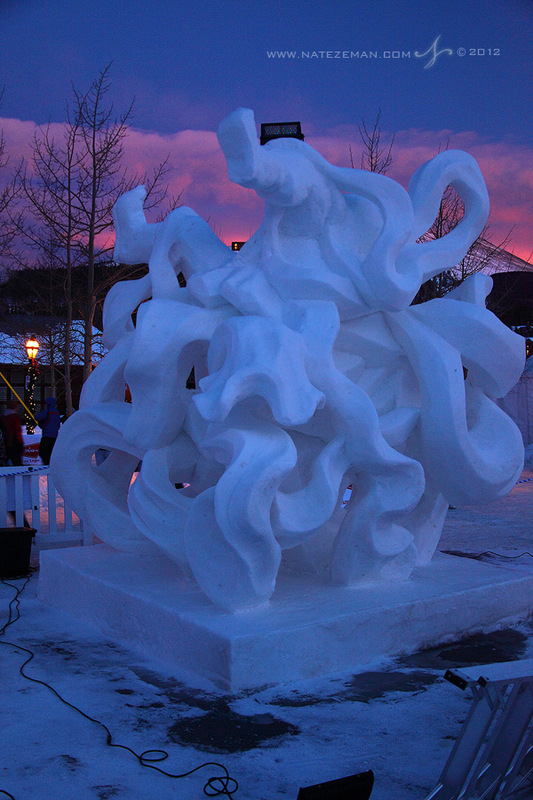 Our sculpture represents the human spirit inside a kind of a human being with four arms, no hands, and two faces. The term “satyagraha” was conceived and developed by Mahatma Gandhi. He deployed satyagraha in the Indian independence movement and also during his earlier struggles in South Africa." 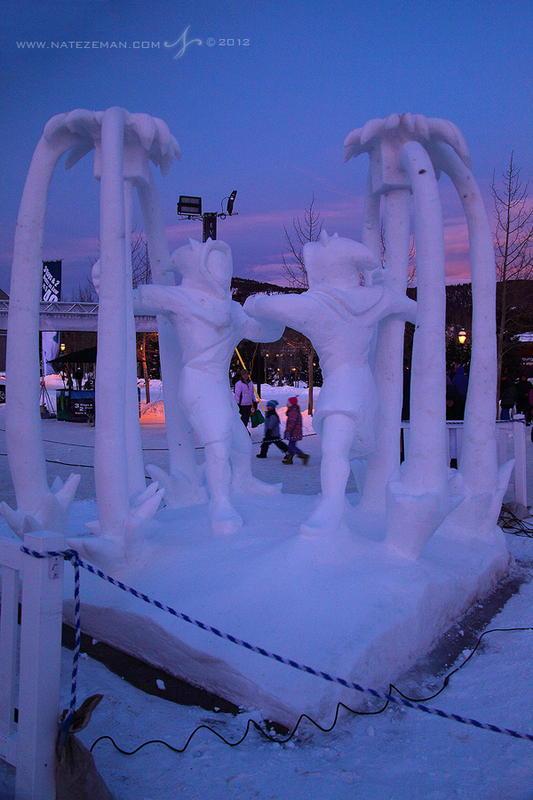 From the official event program: "This is sculpture of ancient Mongolian-style wrestling." From the official event program: "Correfoc or “fire-runs” are among the most striking features present in Catalan festivals. In the correfoc, a group of individuals will dress as devils and light fireworks. While dancing to the drums of a traditional gralla, they will set off their fireworks among crowds of spectators. The correfoc can come in many forms. Some are simple parades using fireworks and effigies of the devil or dragons." a strong accent while the other hits a weak, melding the two voices into a nearly indistinguishable single sound. They repeat brief motifs at staggered intervals, often imitating natural sounds, like those of geese, caribou or other wildlife, until one runs out of breath, trips over her own tongue, or begins laughing, and the contest is then over. The old woman who teaches the children corrects sloppy intonation of contours, poorly meshed phrase displacements, and vague rhythms exactly like a Western vocal coach." From the official event program: "In the 1930’s, “ice houses” were essential for the preservation of meat, poultry and fish. 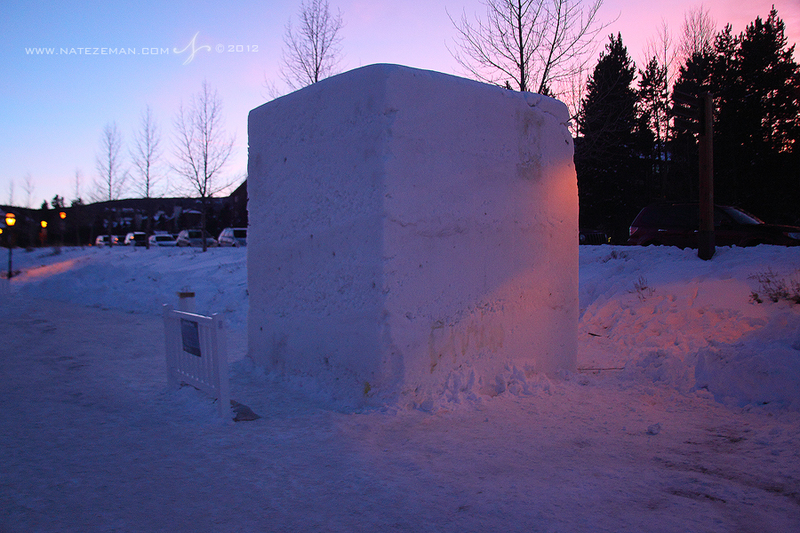 On the Saint Anne River in central Quebec, Canada, ice was sawn from the frozen river to furnish the many ice houses in the region. It was during this ice harvest that millions of small fish, know as Tommycod, were discovered swimming upstream to spawn in the waters under the ice. Soon after this discovery, hundreds of people began making their way each winter to the mouth of the Saint Anne River, by train, or by horse and sleigh, just for the ice fishing. Today, in mid December, the inhabitants of the region install row after row of small heated fishing huts on the river ice, where thousands of visitors can enjoy the pleasures of Winter-time fishing." From the official event program: "The space shuttle Atlantis blasts off for the last time. Over the years NASA has provided mankind with breathtaking discoveries, huge jumps in technology, and sometimes incredible tragedy. 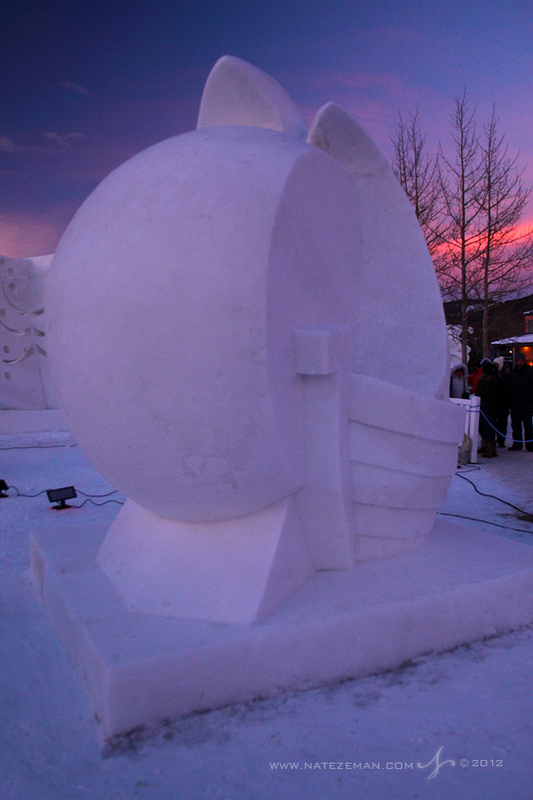 This piece expresses our gratitude to their dedication to discovery and science. The December launch to the International Space Station only clears the way for new advances and discoveries. Thanks NASA, we will never forget." 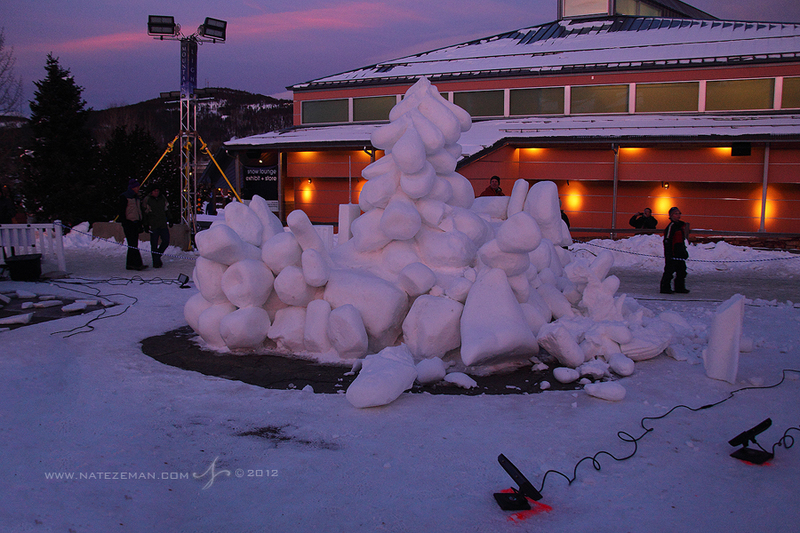 Unfortunately this sculpture fell after near completion. 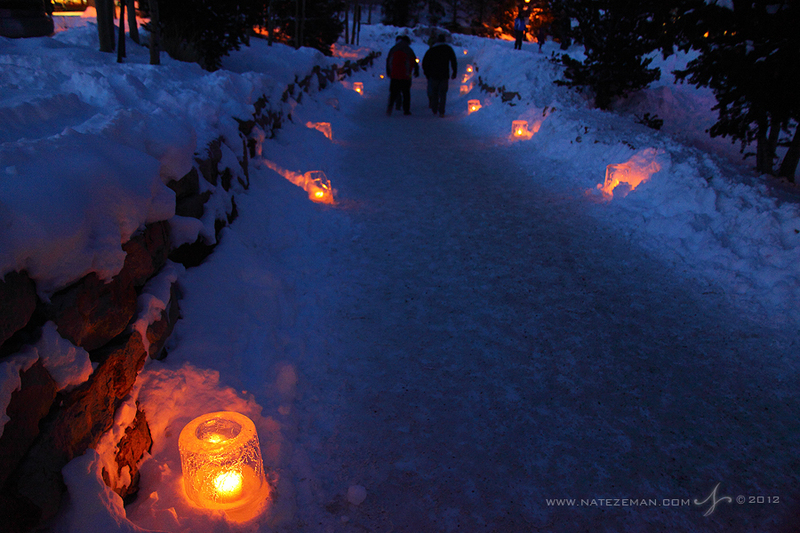 Ice lanterns light the way. 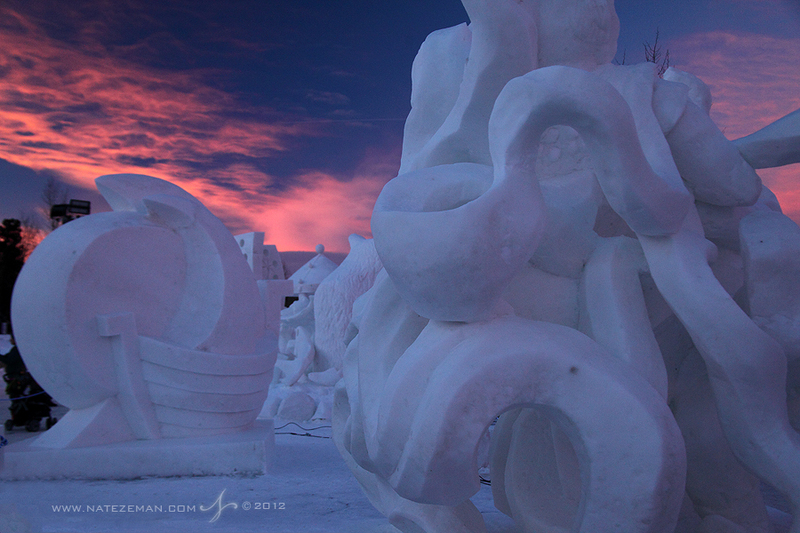 After photographing the sculptures the clouds were still an amazing shade of pink.